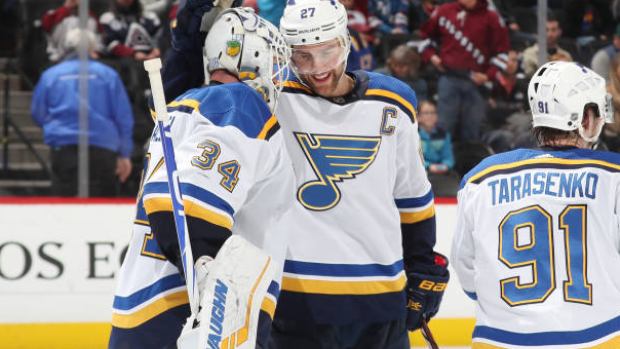 DENVER — Jake Allen made 32 saves, Vladimir Tarasenko and Zach Sanford scored 57 seconds apart in the third period and the St. Louis Blues beat the Colorado Avalanche 3-0 on Saturday for their ninth straight victory. The winning streak is St. Louis' longest since also winning nine in a row from Oct. 15-Nov. 5, 2002. Jaden Schwartz added an empty-net goal. TAMPA, Fla. (AP) — Nikita Kucherov had a goal and an assist in the third period and Tampa Bay beat Montreal for its fifth consecutive victory. Andrei Vasilevskiy made 20 saves in his second consecutive shutout and franchise-record 18th for his career. Vasilevskiy tied Vegas' Marc-Andre Fleury for the NHL lead with six shutouts. Yanni Gourde also scored, and Steven Stamkos had two assists, helping Tampa Bay improve to 7-0-2 in the past nine games. Tyler Johnson scored his 21st goal of the season. PHILADELPHIA (AP) — Travis Konecny scored his second goal of the game 1:27 into overtime and Philadelphia beat Detroit after blowing a four-goal lead in the third period. Detroit remained winless in Philadelphia for more than 20 years. The Flyers are 15-0-1 at home against the Red Wings since getting swept in the 1997 Stanley Cup Final. They will again Sunday night in Detroit. Detroit tied it on Anthony Mantha's second goal of the game with seven seconds remaining in regulation. Nolan Patrick had a goal and two assists, Scott Laughton and Shayne Gostisbehere each had a goal and an assist and Jakub Voracek also scored for the Flyers. Tyler Bertuzzi had a goal and an assist for Detroit and Thomas Vanek and Gustav Nyquist also scored. PITTSBURGH (AP) — Michael Frolik had the first of four second-period goals for Calgary and the Flames beat Pittsburgh to end a four-game skid. Frolik, Austin Czarnik, Travis Hamonic and Sam Bennett scored during a mid-game 17-minute span. Andrew Mangiapane also scored for Calgary, and Mike Smith made 34 saves. Evgeni Malkin had two third-period, power-play goals for the Penguins, Sidney Crosby had a goal and two assists, and Jake Guentzel added a goal. RALEIGH, N.C. (AP) — Petr Mrazek stopped 33 shots in his third shutout of the season and the Carolina beat Dallas to move into a wild-card playoff spot. Justin Williams and Brock McGinn scored less than four minutes apart in the first period, and Micheal Ferland added a power-play goal in the third. The Hurricanes improved to 16-5-1 in their last 22 games, the most wins and points in the NHL in that span. Anton Khudobin made 24 saves for the Dallas. The Stars were shut out for the second straight game, after losing 6-0 to Tampa Bay on Thursday night. CHICAGO (AP) — Artemi Panarin had two goals and an assist against his former team and Columbus beat Chicago for its fifth win in six games. Pierre-Luc Dubois added a goal and an assist, Cam Atkinson and Josh Anderson also scored, and Sergei Bobrovsky made 39 saves in his sixth straight start. Chicago had won eight of nine to get back into the wild-card race in the crowded Western Conference. Patrick Kane had a goal and an assist while extending his points streak to 17 games, matching the longest in the NHL this season. Jonathan Toews also scored. GLENDALE, Ariz. (AP) — Darcy Kuemper stopped 21 shots and Arizona spoiled Auston Matthews' return to his hometown with a victory over Toronto. Alex Galchenyuk and Josh Archibald scored. Matthews grew up in Scottsdale. NEW YORK (AP) — Mathew Barzal and Anders Lee scored in the third period and New York beat Edmonton in the final game of the regular season at Barclays Center. Ryan Pulock, Valtteri Filppula, and Brock Nelson also scored, and Devon Toews had two assists to help New York win for the fifth time in six games and improve to 21-5-2 in the last 28. Robin Lehner stopped 34 shots for his 18th victory, moving to 14-3-1 since Dec. 18. Ryan Nugent-Hopkins and Leon Draisaitl scored for the Oilers. They have lost 10 of 11. The Islanders moved to Brooklyn for the start of the 2015-16 season but have split games this season between Barclays Center and their former home, the Nassau Coliseum. New York's final 12 home games will be at the Coliseum. WINNIPEG, Manitoba (AP) — Ryan Dzingel scored at 3:44 of overtime to lift Ottawa past Winnipeg. Mark Stone, Rudolfs Balcers and Matt Duchene scored power-play goals, and Stone and Dzingel each had one assist. Anders Nilsson stopped 23 shots to help the Senators improve to 3-7-0 in their last 10. Tyler Myers scored twice and Brandon Tanev added a goal and an assist for Winnipeg. They each scored a short-handed goal. LAS VEGAS (AP) — Max Pacioretty scored twice, Malcolm Subban made 29 saves in his first start since early January and Vegas stopped Nashville. Vegas snapped a three-game losing streak, and a franchise-record five-game skid at T-Mobile Arena. SAN JOSE, Calif. (AP) — Joe Pavelski, Logan Couture and Timo Meier each had a goal and an assist to lead San Jose past Vancouver. Pavelski snapped a tie 13:06 into the third period. Meier and Couture assisted on his team-leading 31st goal. The Sharks won for the seventh time in eight games to remain in a tie with Calgary for the Pacific Division lead. The Flames won 5-4 at Pittsburgh. Martin Jones stopped 31 shots as San Jose extended its point streak against Vancouver to 13 games (12-0-1) with its eighth straight home win against the Canucks. Vancouver hasn't won at San Jose since March 31, 2016. LOS ANGELES (AP) — Charlie McAvoy scored with 1:13 remaining and Boston beat Los Angeles for its fifth consecutive victory. Jake DeBrusk scored for the third consecutive game, and Brad Marchand and Patrice Bergeron added goals. Tuukka Rask made 23 saves for the Bruins, who are 7-0-3 in their past 10 games. Ilya Kovalchuk had a power-play goal for the Kings, who have lost four straight. Alex Iafallo also scored. Jack Campbell, a surprise starter with Jonathan Quick out because of an illness, made 20 saves.